ENFID envisions a world with peace and stability in which people’s human rights and dignity are respected. We believe that the voices of the marginalized should be heard and that they can influence those who make decisions that affect them and the choices they make. ENFID’s lobby and advocacy goal is to advocate and be the voice of the marginalized. 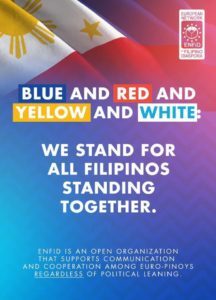 to increase the awareness of Filipinos living in Europe to contribute and take actions in solidarity with marginalized people and influencing governments and businesses to become responsive. 3) prepare and publish position letters and statements on lobbying points and actions addressed to concerned governments, on issues such as trafficking, recruitment irregularities, victims of violence, social injustices, among others.